The perfect game in baseball is a rarity among rarities. Only a handful of no-hitters are seen in a season of baseball, but the perfect game of 27 consecutive outs and no base runners has been achieved only 18 times in baseballs modern era. In golf, the perfect game is all 18 holes played in par or better, and it is a seemingly reachable perfection. Like a dangling fruit just out of hand’s reach, par golf sits there printed on the score card. For the majority of golfers, it is as unattainable as pitching in the major leagues. The quixotic and perverse nature of golf is that anyone with the means can play a round where a professional tournament is held (aside from uber private locales). 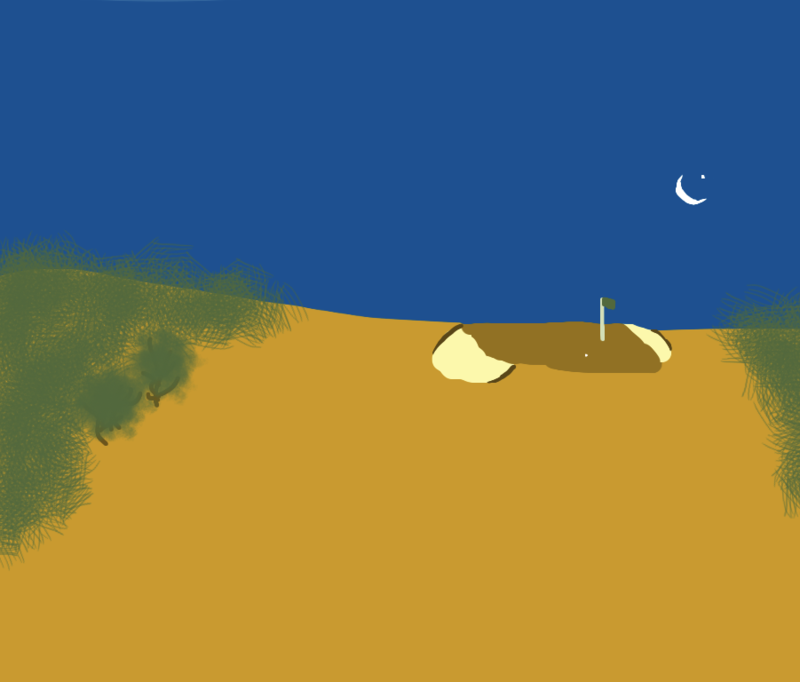 And during that round, the average golfer may get a glimpse of perfection in the form of a par on a famous hole, a perfect sand blast to within a foot of the cup, or a chip that clatters against the pin and settles into the hole. These transcendent moments of golf perfection are gobsmack hits of opium for the golfer that brings the poor hack coming back for more. On the score card though, these bright spots of perfection are just holes in the roof letting in shafts of celestial light. I used to keep a golf log, and over the course of two years, my best scores on every hole on my home course resulted in a perfect 72. It was in me, but I suppose I never let it out. Woe betide the golfer who yearns for more and tried to do something about it. I have finished reading the testimony of John Richardson, who did such a thing and is the proselytizer of the perfect. His book, Dream On: One Hack Golfer’s Challenge to Break Par in One Year (link), is an engaging story that requires golfist faith -the faith that the honesty of the player is a given and that his tale is as true as a score card submitted for handicapping at the clubhouse. It is no big fish story, John’s tale. I find a lot of things in common with John. We are of similar age growing up in areas where golf is part of the social mesh -me in North Florida, and John in Northern Ireland. I spent many years at the now defunct Baymeadows in Jacksonville, Florida, dreaming of playing with the best while struggling to break 90. Both of us admired Seve Ballesteros and his swashbuckling approach to the game. Both of us gave up golf to become working adults -me to go to college, medical school, and postgraduate training, John to work at becoming a successful entrepreneur. And both of us took up golf again at similar points in life, after marrying and starting families. What is different about John was that he took his obsession and channeled it into a deliberate path to perfection. At the start, he struggled to break 100, but within a year, he broke par. While it was no surpise, the ending of the book in the kind of ethereal round of golf that all hackers dream of, the tension and drama were there nonetheless. The great thing about the book is not necessarily the end result, but the year long journey he took. John proved that all the well worn excuses that golfers have about themselves -including mine about not letting myself be scratch, are mistaken justifications for continued hacking. In fact, whenever he fell into a rut, it was revealed to him that it was a swing error, something as elemental as grip, posture, stance, and alignment, and not always his negative thoughts. That is correct -it’s not your negative thoughts, but instead bad form and lack of practice that leave your game rotting at bogey or worse. He does seek professional help -and I have taken this advice by taking my first lesson with our amazing new club professional, Mr. Aaron Krueger. He also sought clinical motivational advice -not a shrink, but very close, because a golfing rapture is limned by golfing madness. And he practiced. A lot. Particularly his short game. This is like one of those miracle baseball movies you can get where some average Joe all of a sudden is throwing heat in the big leagues. I read his book with the same suspension of disbelief that I have for big fish stories, with golfing faith. It gives me hope, and a renewed sense of purpose. So what does it all mean? I will hereby publicly declare my intention to break par by the end of next season (October 31, 2012) and bring you along with me. May good golf come walking with me and endow my ball with angel wings. Golf is about competition, and it starts with competing against the racing horses of fear, ambition, greed, and pride. In competing against others, golf is a beautiful combat sport. 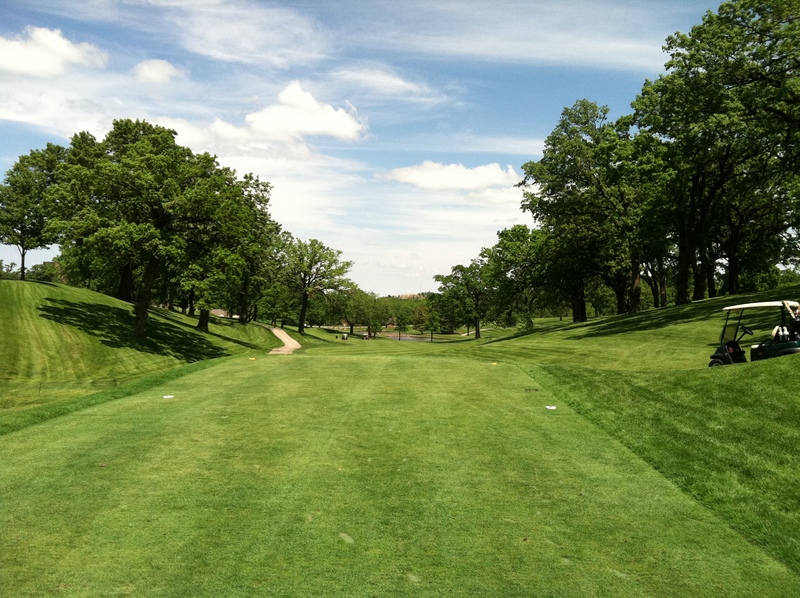 Wakonda holds several competitions and the season long two man best ball tournament is among the best in that very strong teams can get beaten by seemingly weaker teams, based on how well the players master themselves and their competitors. 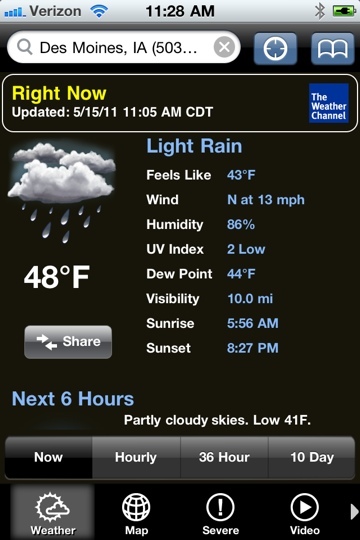 Today is a good day for golf as there is no lightning, but it is raining and cool in the forties. If no one shows, I will be disappointed. 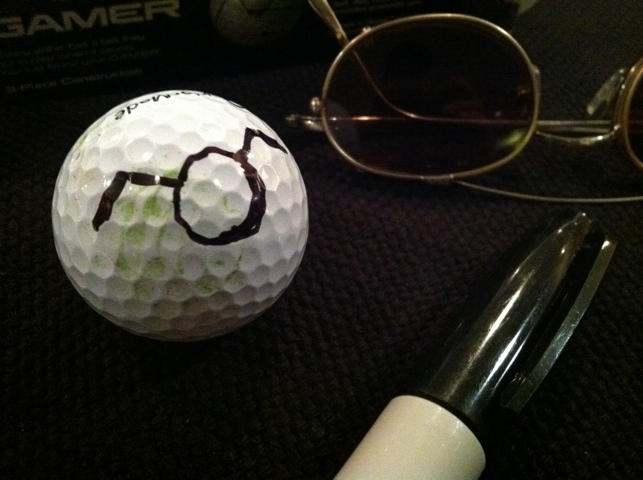 Pictured above is my ball marked with my golfist symbol – a golfball with angel wings. I came across this wonderful archive article in the New York Times about the only golf course in Afghanistan. I hope it is still open. It’s proprietor is clearly a golfist, and yearns for the day that will allow young Afghans to play golf in peace. This is a link to John Richardson’s breakparblueprint site. On the page is a fun video of John attempting to birdie a longest and possibly scariest par 3 on the planet. You need to helicopter to the tee box and the drop is beyond scary. It reminds me of this par 4 in Maui that featured a 400 foot elevation drop to a green 400 yards out. I drove the green but three putted. 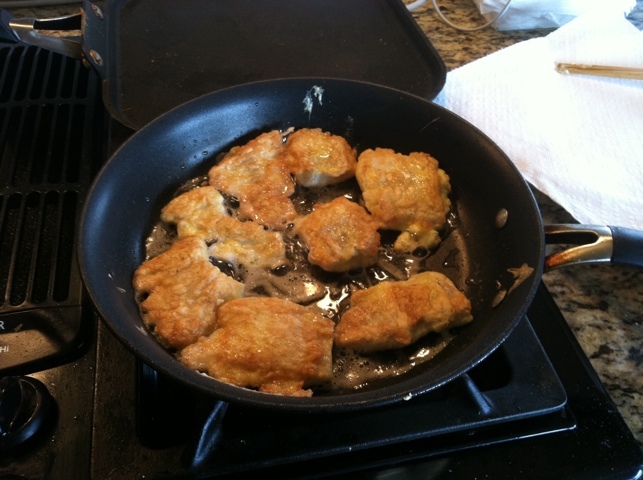 We lost my mom last year, but memories of her cooking remain. This dish, Pacific cod battered and pan fried called saeng sun jeon is one of my favorites to have with cold rice and kimchi. These little moments are how the departed live on.